Tasmanian tree fern (Dicksonia antarctica), also called soft tree fern or hardy tree fern, has enormous feathery fronds that conjure up images of tropical paradise. However, it is known as one of the most cold hardy tree ferns and though it is native to southeastern Australia and Tasmania, it is one of the most widely planted tree ferns in North America. 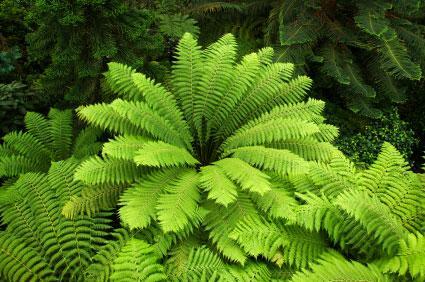 The Tasmanian tree fern is named for the 18th century British plant explorer, James Dickson, who discovered it. The species name "antarctica" refers to the southerly range of the plant. It is an ancient species, dating back to the time of the dinosaurs. Though they are more cold hardy than most tree ferns, Tasmanian tree ferns will need to be moved into a greenhouse or sunroom for the winter in places where temperatures drop below 20 degrees. It's hardy in USDA zones 9 to 11. A slow-growing evergreen fern with a thick tree-like trunk, the fronds of the Tasmanian tree fern emerge from the top as a canopy, arching gracefully downwards as they mature. In the wild the Tasmanian treed fern can reach 20 to 30 feet high, but in gardens it is usually much smaller, often growing to just 10 feet. Individual fronds can grow six to 10 feet long. The pinnae, the small leaflets which make up each frond, are dark green on top with a lighter underside. Tasmanian tree ferns are an impressive focal point for a shade garden and are a great candidate for poolside plantings. Plant other ferns of various textures and colors beneath it for a cool, lush look. In a large planter, they can provide a tropical feel in patio areas when grouped with pots of bright-colored dahlias and large-leaved foliage plants such as elephant ears, Caladium, and striped cannas. Epiphytic plants, sometimes called 'air plants,' are often found growing on the trunks in the wild - for a really exotic look, try growing some on your fern. Good choices include bromeliads like Tillandsia, and orchids such as Dendrobium or mosses and small ferns. These plants like acidic soil with lots of organic matter and good drainage. Plant in a shaded or partially shaded location and water frequently in hot weather. You actually need to water the trunk as well as the roots of the tree as it is composed of aerial roots. Feed with a balance fertilizer in spring and spread a layer of compost over the root zone each fall. When a hard freeze is expected, wrap the plant in landscaping cloth or burlap and protect the new growth in the center of the crown by covering it with a pile of straw. Tree ferns do not need pruning to shape, but cut off any yellowing fronds as they appear. 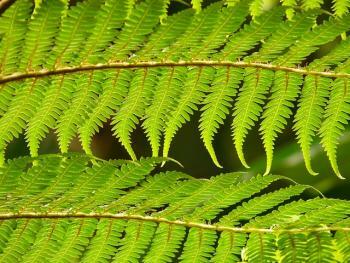 When a tree fern is stressed by high temperatures, drought or too much light, it is vulnerable to thrips, tiny insects that feed on the plant's juices. Remove infected foliage and treat plant with insecticidal soap. Other non-chemical methods of control are attracting or introducing predators such as ladybugs and planting repellant plants like garlic. The plants are propagated by spores, or by removing offshoots from the base of mature plants. As this species is threatened in the wild, be sure to buy only nursery-grown plants from reputable sources like Fraser's Thimble Farms. 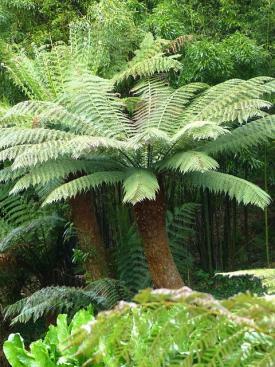 Tasmanian tree fern is widely available in the climatic regions where it can be grown. Ferns do not have flowers. They reproduce by spores formed on the underside of the leaf or in special fronds. The sori, which hold the spore bearing sporangia, look like soft brown or black pads in lines or stripes under the leafs. On the Tasmanian tree fern, the sori are tiny dots, in the edges of the pinnae, only one millimeter in diameter. Only some fronds, called fertile fronds, produce the reproductive structures. This is no ordinary tree fern. Tasmanian tree ferns are a sight to behold and make a tropical-themed garden come to life like no other plant can.